Margarita Engle, a biracial girl living in Los Angeles with her sister, American dad, and her Cuban mother. She wrote her autobiography in poem form, a form of writing that was repeatedly mentioned in the book as something she could connect to. Telling us about the struggles she faced as being ‘Cuban’ in America, she felt isolated, connecting with wildlife and art instead. She longed to return to Cuba as relations between the two countries got worse, and until the last page of the book, she was still praying to return to Cuba to meet the rest of her extended family. 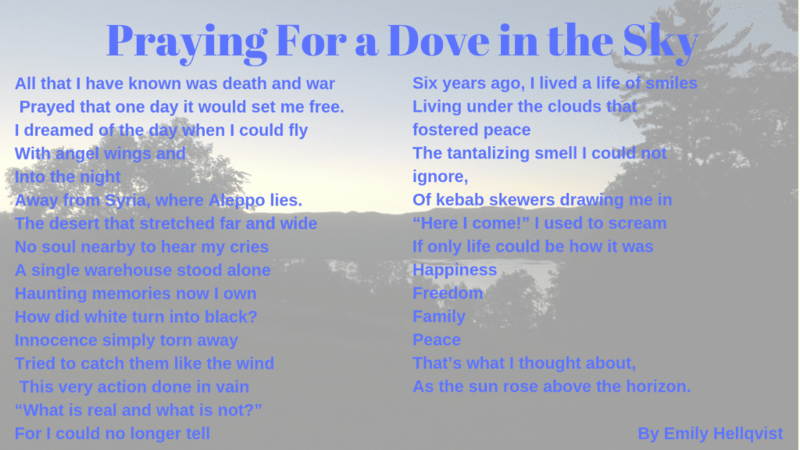 As Margarita told her story in cryptic poem form, a sharp underlying theme stood out as she faced challenge after challenge, discrimination after discrimination. She reminded us throughout the book that when life is out of control, be authentic. When she first began to question her identity, like many biracial kids have done and still do, she wrote, ‘Am I free to need both, or will I always have to choose only one way of thinking?’ (Engle, 28) After futile attempts from her teachers to try and limit her thinking to the ‘American’ way, she stayed true to who she was. She couldn’t control what her teachers did, what they chose to say to her, but she chose to be authentic, questioning the norm. When Cuban and American relations deteriorated, it was out of her control, and kids ridiculed her for it. They ridiculed her mother for it. ‘Are people staring from behind ruffled curtains because I’m so disobedient, or because they know that Mami is from Cuba?’ (67) A child should never feel like she doesn’t belong somewhere just because of her family background and her experiences. She should never feel alienated in the country she grew up in. Unfortunately, that happens way too often in modern society and all throughout history. 60 years ago, African American women were still regarded as insignificant in the US. More than 200 years ago, places like Georgia and Alabama had slaves, African Americans who were discriminated against, just because of their skin color. Now, people in the LGBTQ community are still being alienated from their own communities, many committing suicide because of the lack of compassion shown towards them. Nobody should feel like they don’t belong in a place they call home. Nobody should feel isolated because they are different. We are moving forward as a society. Perhaps you will end up being accepted, just like black people are now accepted, and members of the LGBTQ are being accepted in the developing world. Perhaps you will feel like you belong somewhere, but that has to come, from being authentic. Throughout this Revolution unit, Eric, Cathy, Jacob and I studied the Cuban Revolution. We proceeded to make a Common Craft video about the Revolution, explaining the five main turning points from 1952-1962. Our first turning point in our project was when Batista conducted a military coup, seizing the government in 1952. In 1953, our next turning point, the first act of rebellion took place, the one that led to many more in the future. Just three years later, the revolutionaries were back with their second attempt at overthrowing Batista’s government. In 1958, many of Batista’s men switched sides and pledged their loyalty to the rebels, who represented the Cuba they wanted. Finally, in 1959, the revolution was over and by 1962, Castro had established universal health care and raised the literacy rate but governed Cuba as a Communistic country. We tried to portray that using detailed drawings, and explaining the events as concisely as we could. Working as a four, we assigned different roles: Cathy worked on the illustrations for the video, Jacob and I wrote the script, and Eric did the final leg work of putting together the video. We all contributed to narrating. It was a piece of work that we put hours of focus in and communicated effectively to make sure the work was done to the best it could be. It was an incredibly rewarding project, and as a group, strengthened our understanding of the Revolution while also having a great time in the process. Who wanted to feel alienated in their own country, to be a stranger where she considered home? Growing up in a small village in Kocho, Nadia and her family were considered to be insignificant in Iraq. All the Yazidis were the minorities that not many cared about. But Nadia had joy in her life; witnessing marriages of neighbors, laughter with friends and a Romeo and Juliet style romance between her brother and another girl in the village. All their lives they’ve faced discrimination, oppressed in their Motherland. They weren’t supposed to have a voice and people expected them to give up, but they didn’t think that one teenage girl could stand up for herself and those that she loved. They didn’t think that breaking this teenage girl would be so hard. They didn’t think that by capturing this teenage girl, the pain and suffering that they had inflicted upon her would be written down on paper, and later win the Nobel Peace Prize. They didn’t think that after all this, Nadia would still have a voice. Throughout this entire memoir, ‘the human spirit is a powerful force to be reckoned with’ became the prominent theme. Early on from the book, we were introduced to Nadia’s family, and the village she lived in for her entire life. Although men had a lot more power, she still liked to speak up for herself, and fight for what she believed in. When ISIS was at the doorstep, Nadia still didn’t give up hope and believed that she had a chance against the cruel terrorists wearing masks that covered most of their faces. ‘Breaking free from the crowd, I ran toward a house where a militant stood guard on the roof and threw my head back, spitting at him with all the force I could muster. In Yazidi culture, spitting is unacceptable, and in my family, it was one of the worst things you could do. Even though I was too far away from the militant for my spit to land on him, I wanted him to know how much I hated him.’ (Murad, 93) When ISIS took away her home, killed her brothers and her neighbors, she openly expressed her hatred to them because she still believed that she was stronger than those men, and she was determined not to let them break her. She showed how strong the human spirit was, and that she had a lot of fight left in her. Throughout history, we repeatedly see examples of this, when Martin Luther King stood up for what he believed in with peaceful protests. Despite the countless setbacks he faced, despite the years he had to stay in prison, he fought for what he believed in, and eventually giving the ‘I Have a Dream’ speech. Like Martin Luther King, Nadia stood up for what she believed she had to do and told us exactly how strong the human spirit was. One of the most dangerous weapon one can have is to stand up for themselves and share their experiences of surviving through hell. Without that courage to share with the world what had happened, people will never learn from their mistakes. They would never learn to condemn behavior that had inflicted pain and suffering to another living being. Unfortunately, for Nadia, she went through hell, but she had the courage that many didn’t, and spoke in front of the UN, sharing what had happened to her. Even though most of the people sitting at that UN conference couldn’t relate to what had happened to this Yazidi woman, there were still those that could. ‘They listened quietly, and afterword a Turkish woman came up to me. She was crying. “My brother Ali was killed,” she told me. “Our whole family is in shock because of it. I don’t know how someone can handle losing six brothers all at once.” “It is very hard,” I said. “But there are families who lost even more than us.”’ (301) There is always somebody with similar experiences, and in a world of almost eight billion people, we will always find those who understand our struggles. Being biracial, I often feel like I don’t belong anywhere. In China, I was referred to as the foreign girl, and in Sweden, the Chinese girl. I always just stood out. Over the years I never really understood why people had to discredit half of my ethnicity, and in a lot of ways, I felt like Nadia standing in front of the people of the United Nations. I felt like they wouldn’t understand me, and many didn’t. Many couldn’t understand what I was going through and they didn’t know the constant feeling that 50% of my identity getting forgotten. But also like Nadia, there were also those who were able to understand the constant struggles that I have faced. Often I felt like maybe I should just let them assume where I came from and come to conclusions based on my appearance, but the patriotic side of me always felt the need to correct them. In both cases, for Nadia and I, the human spirit of saying our truth, and not let anybody else express our feelings for us, I believe is a force to be reckoned with, just that her’s is on a much grander scale. Nadia could’ve given up all hope. However, she boldly stood up against Islamic State fighters, demanded that she wanted to see her sisters, attempted to escape multiple times even though she was caught and beaten. She didn’t give up hope because she had that mindset of being stronger than those trying to tear her apart. Nadia Murad was just a poor girl from Kocho, but unlike so many girls that had taken their own lives in the bathrooms of their prison homes, she kept on going. The only reason she was able to make it in Germany and dedicate her life to helping other Yazidis, was because she kept going. The fighting spirit that Nadia possessed was evident all throughout the book, and time and time again, showed us that it was a force to be reckoned with. What had changed in Russia from 1905-1939? During 1905-1939, several things in Russia changed due to the impact of the Revolution. These changes included the motives of each new government and the policies that each government wanted to put in place. With false promises of a better future, circumstances got worse, and the conflicts that happened made sure that the future was no better than when Tsar Nicholas was still in power. With the increased violence all throughout the country, there were a lot more fear and hunger, especially when Stalin rose to power and the terror caused by the Bolsheviks became even worse. Between 1905-1939, although Russia underwent significant changes, characteristics of Russia still stayed the same. Throughout the 34 years, the conflicts for power and the constant rebellions was a reminder of the Russia everybody was quite familiar with, but because of the different policies that kept on being put in place, the people weren’t happy about it and fought back in the only way they knew how. The social classes also didn’t change much between 1905-1939 because no matter who was in power, there was still the clear divide between the peasants and everybody else. Alexander and Sergei’s lives were very different, not just because of the social classes but it did dictate a lot of their opportunities and options that they had in life. Because Sergei was a soldier, he was always kept fed and his higher status in the military gave him access to a better life. The policies didn’t affect him as much as it affected Alexander because Sergei was able to adapt to these policies since he didn’t have to work in the factories from dusk to dawn, living on hardly a piece of bread. And for Alexander, he was a peasant his entire life and was giving up rations of his own food to support his family. He worked tirelessly, and still barely earned anything. Even as the policies constantly changed, he was at the wrong end of the blow, with the blade threatening him and his family. He thought that things would get better, but it didn’t. What was left of his hope for a better diminished even further, and could do nothing but embrace the life ahead of him that became, if even possible, worse. In my opinion, the 34 years of suffer and pain was definitely not worth it because looking at the bigger picture, things more or less stayed the same. Although the people got rid of the monarchy in Russia when they overthrew Tsar Nicholas II, their problems weren’t over because they subsequently fought more battles against other powers who wanted to take over. Then with the involvement with World War I, and internal struggles in the country, millions of lives were lost when there was no clear purpose. Famine struck the country, killing 5-6 million people. Those 5-6 million probably wouldn’t have died of the famine because of the food shortages caused by all these conflicts. True, the peasants were already starving, but the conditions from 1905 only got worse, when the people expected things to get better. Essentially, there was no improvement to Russia, and countless of citizens lost their lives to a cause that brought no better future. Therefore, for the lives of millions, the 34-year struggle was really not worth it. Huntsman, Wizard, Pooh Bear or Eowyn? I decided to make a quiz for the November Multimedia Post because I wanted to do a Characterization multimedia post (I’ve always done Written Characterization before) and decided that maybe I could just make a quiz, and make the post more interactive with the audience. It is a five-question quiz that will tell you if you’re Huntsman, Wizard, Pooh Bear or Eowyn, and in the results, has some of their background information, memorable quotes and just who they are. I think this was the best option for the Characterization post for the sole reason that it’s more interactive. It shares an understanding of this novel with people that might not have ever read this book but could connect with the characters with their own traits. The time had come. There was no way that the smaller countries would prevent Europe and America from getting their hands on the ancient Capstone. The top of the Pyramid of Giza that when restored on the top of the pyramid, would give the beholder’s country absolute power for 1000 years. The particular sunspot (Tartarus Sunspot) occurs every four thousand to five thousand years, and when reaching earth, will raise the temperature up to heights beyond imagination. The last sunspot was prevented with this Capstone, and now each piece is hidden at each and one of the Seven Ancient Wonders. To prevent the Europeans and the Americans from obtaining every part of the Capstone, a small team led by Jack West Jr, began the preparation of more than a decade. Just to stop the greatest powers. As the years went on, the bond between each member of this team grew stronger, a family that was formed from people of different backgrounds. In the 7 Deadly Wonders written by Matthew Reilly, he takes us on a journey filled with history and myths, but its most prominent message would be that family will always be there for you, no matter what. Animals have been part of families for a long time now, dating back several centuries. Jack West Jr.’s mission team might not be an ordinary family, but it definitely still was a family. The family pet, so to speak, goes by the name Horus, a falcon. “Horus, it seemed, only cared for one person. Jack West.” (Reilly, 147). Jack West Jr. rescued Horus when she was under the brutal care of Cal Kallis. That was life-changing for Horus because Jack always treated Horus with kindness. It was the actions inflicted upon him that Horus lay his loyalty at rest to the service of the Minnow’s team leader. This bond of loyalty seems almost cliché if you think about all the novels out there in the world that has this type of relationship between two characters. In just the first book of The Hunger Games alone, we can see the acts of defiance influenced by loyalty. Just like how Horus was abused by Cal Kallis, making the falcon devote his life to his savior, Katniss Everdeen vowed to win for Rue when she was killed. In both situations, both characters always had each other’s backs, until the last minute. From this, we can clearly see that not only is it a theme in the Seven Deadly Wonders, it is also a consistent theme in many books. The feeling of bond and loyalty lies so strong within the group that; they would risk their lives for each other. This was shown when Big Ears sacrificed himself for the safety of Lily, willing to die for the cause and the family if it meant saving the baby of the family. “The bullet passed through Big Ear’s skull, exploding out the other side and he fell instantly-crumpling like a marionette whose strings have been cut-falling to his knees midway between the generator wagon and the airstairs, dropping Lily from his lifeless hands.” (354). In real life situations, we see sacrifices among family, because their bond is so strong that they are willing to give up everything they know, everything they are just for that one person. In the Syrian Civil War that is still taking place, many men gave up everything they’ve known just to fight for what they believe in and trying to keep their families of becoming victims of war. The mothers of refugee children gave up their happiness to attempt to find happiness for their children, hoping that they would be growing up in a place that fosters hope. It all came down to that family bond and sacrifice. In the case with the 7 Deadly Wonders, Lily and Big Ears had such a close bond, the close bond of family that made this sacrifice possible. Throughout the entire novel, the reliance on teamwork could be seen, in each of the Ancient Deadly Wonders as they tried to retrieve the pieces of the Capstone. Without this teamwork and sacrifice, they wouldn’t have been able to stop the Americans or the Europeans. These missions were not easy, and they lost people along the way, but they kept going, because they had one common goal, and their trust in each other was enough to make them lay down their lives if it meant accomplishing their end goal of frustrating the progress of their opponents. Therefore, we can see that the main theme is that family always being there for you no matter what to be the driving force of this novel, one that cannot be ignored. I created an alternative book cover for 12 Years a Slave because I wanted to show a prominent theme, but not a cliche theme that was evident, for example, the horrifying truths of racial segregation. Instead, I decided to choose a theme that I could, on a personal level, connect with: The power of music and its effects on people. Throughout the novel, he sought comfort in the music that he produced, one of the many factors that kept him going during the harsh 12 years. With this theme, it showed that music didn’t just help himself, but it helped those around him. The symbolism that the violin has throughout the story tells us that it’s the Power of Music that could connect everybody regardless of skin color, the language that everybody could understand, and the sounds that everybody could relate to. 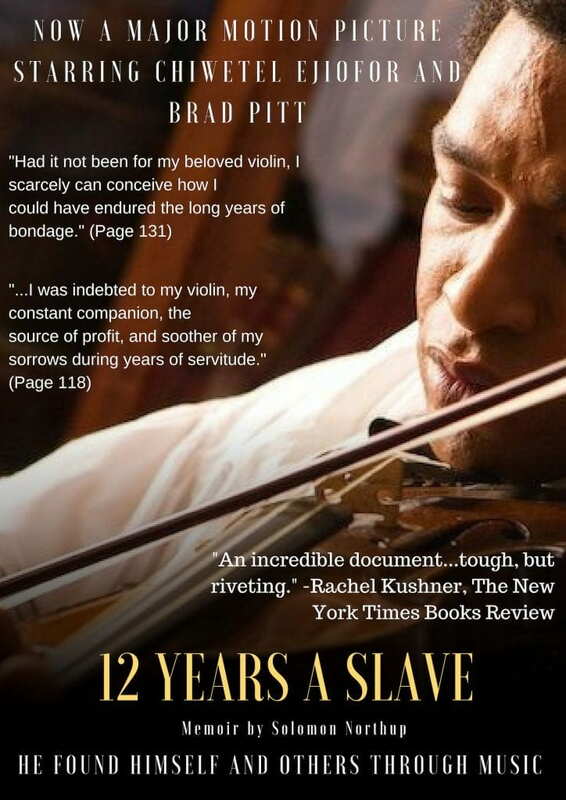 Therefore to me, the Power of Music made the most sense to include on the book cover since it showed something greater than slavery, and on a deeper level, something people could connect to.